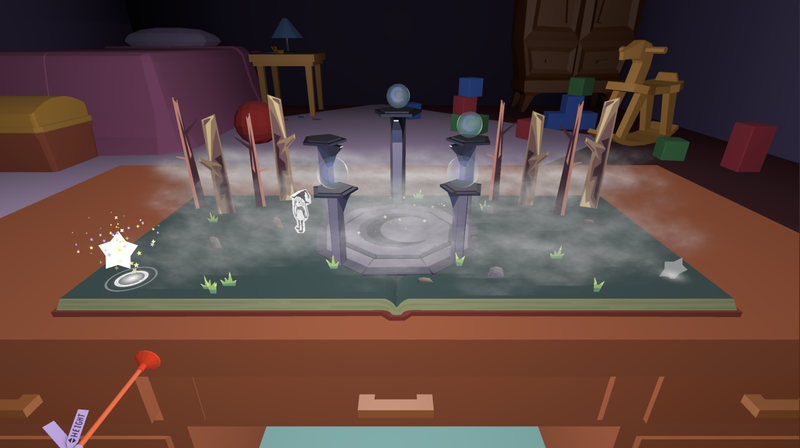 The Indiexpo Blog: User Stories: Bookend Team - Why do a VR Game? User Stories: Bookend Team - Why do a VR Game? The whole Bookend team has never worked on a VR project nor have ever been avid VR connoisseurs up until the creation of Bookend. What we did know, however, was that we wanted to create a unique, well-designed project meant to wow everybody within the University of California: Santa Cruz’s capstone series. Our first thought was to develop a VR title. This idea was two-fold: first, it was supported by the fact that many of us believe that virtual reality as a concept is only budding. We have yet to see the huge mainstream appeal of virtual reality and the technology is only going to improve. We, as the Bookend team, want to be there for the ride (and get a portfolio boost). Second of which, virtual reality was a means for us to truly create an immersive experience allowing the designers within the group to truly flex their design muscles, and the developers to experience developing with virtual reality in mind. In an attempt to explore this idea, we began iterating on Beloved, an atmospheric horror game set within a virtual reality space. We iterated ideas over the course of a couple months such as the player having ghost hands and using telekinesis to guide another individual around puzzle situations akin to a second person exploration game. Although the game was only supposed to take place within a household, the project quickly got out of scope within its narrative, art direction, and programming months into our development cycle. We persevered through months of dead-end conceptualization, eventually leading us to create a narrative-centric puzzle game meant to subvert the expected conventions (grab objects and throw stuff) within a virtual reality space. 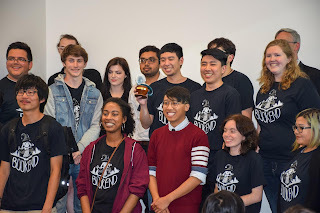 Although started by a core team of ten students for Beloved, we quickly ballooned our team into twenty (ten core members and ten auxiliary members that helped with art, sound/music, and programming) for Bookend’s rise. We definitely wanted the gameplay to be reminiscent of reading through a pop-up book so heavy design iteration went into honing in on that particular feeling. As such, many of our mechanics are analogous to the features of a physical pop-up book. The music and narrative direction, in particular, serve to enhance the whimsical and enchanting nature of Bookend’s aesthetic. Creating Bookend was not without its problems, however, as developing through the affordances of VR. We ran through multiple problems that the affordances of a mouse and keyboard avoided. Namely, controls were our number one issue. We changed our controls scheme multiple times due to player confusion with the Oculus controls. At first, we had it so that the player navigated the game space with their headset, looking at objects they wanted to interact with. We quickly realized that this idea was more trouble than what it was worth. Players quickly grew frustrated at the fact that they had to pinpoint their headset at a small object in order to select it. We then changed the controls to focus on the Oculus Touch. Our first iteration of this was too focused on the Oculus face buttons (A, B, X, Y). We had players press the grip button on the controller and confirm their selection with either A or X. This caused the issue of the player not knowing which button was A or X causing them to become increasingly confused and frustrated. Through a lengthy design discussion, we finally decided to change the controls to what we have now: Point in VR by closing the grip button and confirm the selection with the trigger button. This was due to the fact that the grip and trigger buttons are the largest buttons on an Oculus Touch controller. This changed proved beneficial as when players would get confused about the controls, they would first attempt to press the trigger and grip buttons. Wanting to create a project that mattered to us, the team decided to make a VR project that doubled down on immersion and unique gameplay features. Developing through VR is difficult, especially in the controls department. (Try getting someone to press the A button while they can’t see!) Nonetheless, through multiple months of hard, dedicated work, Bookend slowly yet steadily transitioned from a concept born from the fall of Beloved into a concept that carried its own weight. The last-minute scrapping of our original idea left our team scrambling, but we’re extremely proud with our work thus far. We hope that you enjoy playing through Bookend as much as we enjoyed making it.